When you finally find your favorite burger spot, it truly becomes a special site. 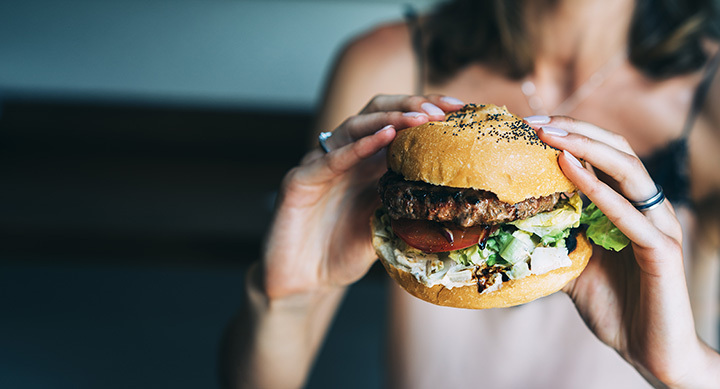 From that first, juicy taste of meat and cheese to the last scrumptious bite, Virginia’s best burger joints will soon become your favorite. Here are the 10 best places to chow down in the state! Repeal Bourbon and Burgers in Virginia Beach, Virginia, pairs delicious, hand-made burgers with the best bourbon, scotches, and cocktails around. All burgers are cooked medium unless specifically asked for another way and come with choice of fries, truffle mac n’ cheese, side salad, or kettle chips. Thirteen different burgers, including the classic cheeseburger to the more adventurous Wicked Pissah (pan friend lobster, cheddar cheese, and Old Bay chips), offer a ton of options. Another favorite: The Fire and Brimstone burger, which comes with fire roasted habanero chutney, jack cheese, Tabasco onion strings, and sriracha. The stylish 80/20 Burger Bar in Norfolk, Virginia, sources all their beef from Leaping Waters Farm in Shenandoah, Virginia, and buys their produce local. All their 100 different beers come from local breweries. The menu is conveniently separated into “burgers” and “not burgers.” The burger side comes with French fries and offers unique takes, like the “El Nino” (Mexican spiced pulled pork, pepper jack cheese and green onion cream), the “Miss Thing” (pimento cheese spread, braised pork belly and fried onions), and the “Junk Drawer” (brisket, Havarti cheese and horsey aioli). 80/20 drips style and substance, with a delectable menu that’ll keep you coming back. Jack Brown’s has quickly expanded, and it’s no surprise given their mouth-watering burgers and over a hundred beers. Business Insider recently voted them the No. 11 Best Burger Joint in America. Their everyday burgers range from location to location, but include the “Danny Laruso” (burger topped with cream cheese and jalapeno jelly), “the Chiflet” (Applewood smoked bacon, egg, and cheese burger), and the famous “Elvis” (burger topped with peanut butter, mayo, Applewood smoked bacon and cheese). Jack Brown’s is a dining experience not to be missed. Gourmet Burger Bistro offers some of the best burgers in the Hampton Roads area. You can’t go wrong with the traditional bacon cheese burger, but if you’re feeling more adventurous, try the pizza burger (topped with sautéed onions, grilled tomato, pepperoni, marinara sauce, and mozzarella cheese). The Empire Burger is their claim to fame, which includes a hand pressed patty with Philly steak topped in sautéed onions, mushroom, and provolone cheese. The Horseshoe Restaurant has served thousands of burgers in its 75 years, and continues to be the go-to diner in South Hill. The Bison Burger is a fan-favorite, along with the Clydesdale Burger, which is topped with southern pimento cheese and fried green tomatoes. Finish up with a slice of pie for a meal to Yelp! about. Bräuburgers Craft Burgers and Beer in Forest, Virginia, uses only all natural, humanely-raised beef sourced from family farms. The 13 different burgers include stylish renditions, such as the Mad King Ludwig Craft Burger (one third pound of fresh Angus beef topped with aged cheddar macaroni and cheese, Muenster cheese, fresh jalapenos, Haus-made potato chips, and served toasted on a Haus brioche or potato bun) and the Zeppelin Double Burger (two double patties totaling 6.6 ounces of fresh Angus beef topped with fresh free toppings and served on a toasted potato bun). Their tap list is quite extensive, too. NN Burger has two locations, one in Tappahannock and one in Kilmarnock and has won the title of “Best Burger” in the Virginia Living Magazine Annual Reader’s Poll and the “Virginia Is for Food Lovers Culinary Challenge.” They must be doing something right. The menus vary slightly between the two locations, but some of the best burgers are the NN Fusion (double-stacked wood-grilled burgers, aged Swiss, sundried tomato bacon jam and truffle Aioli sauce) and the Jammin’ Bacon Blue (imported Danish blue cheese, black pepper bacon jam, onion crisps, and mixed greens). Try the “Tappahannock Twisters” (ribbon-cut fresh potatoes) and a shake to finish off the meal. MELT Gourmet Cheeseburgers in has been voted Loudoun County’s Best Burger for the past six years. The menu starts with the classics, including the bacon cheeseburger and bacon-blue burger. More adventurous eaters will find endless delight in the gourmet burgers, including the Lump Crab Burger (a golden brown, premium, lump crab cake served on a homemade toasted roll with coleslaw, tomato, red onion, and lemon-caper aioli) and the Ahi Tuna Burger (Sushi grade tuna filet, brushed with sesame seed oil and teriyaki sauce, char-grilled rare to medium-rare and topped with melted domestic Swiss cheese served on a homemade roll with onion, watercress, tomato, and wasabi aioli). The Kick-Up Gourmet Beef Burger menu includes Tex-Mex and Parisian inspired burgers, among others. Make sure to try out the MELT special burger of the month, too. Holy Cow in the swanky Del Ray area of Alexandria has one of the 25 best burgers in the Washington D.C. area, according to “The Washingtonian” magazine. The menu comes with pre-made burgers and a “Built-it-Yourself” option. Choose your meat, toppings, and sauce and they’ll bring it right out to you. If you’re not interested in exploring your culinary chops, try The Popper, a burger topped with cream cheese, bacon, fried jalapenos, Chipotle ketchup and garlic aioli. The Burger Bach is a New Zealand-inspired gastropub with locations in Shortpump, Durham, Charlottesville, Midlothian, and Carytown. Burger Bach is committed to using “only the best quality, all natural ingredients.” The menu changes slightly depending on the location, but the basics are the same. The New Zealand all-natural, grass-fed beef and lamb burgers are the main attraction, with local favorites like the Hangover Cure (Bach-made green chili sauce, uncured bacon, Bach-made hot sauce, fried egg, American cheese, tomato, caramelized onions, and free-range mayo) and the Queenstown (grass-fed New Zealand lamb, caramelized onions, Gruyere cheese, sautéed wild mushrooms, and fresh tarragon sauce) making life-long customers with every first bite.